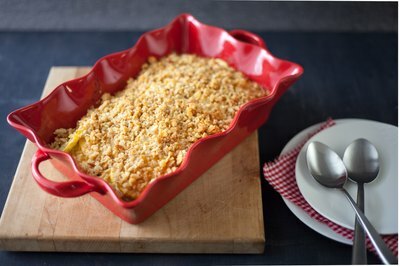 Top your squash casserole with crunchy Ritz crackers for a convenient crust that takes minutes to prepare. 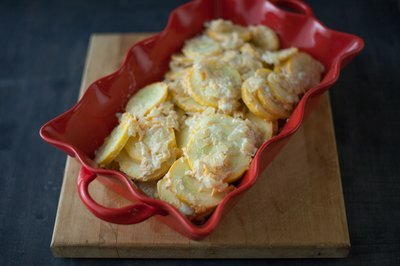 Use either fresh or frozen squash slices for this dish depending on the time of year. 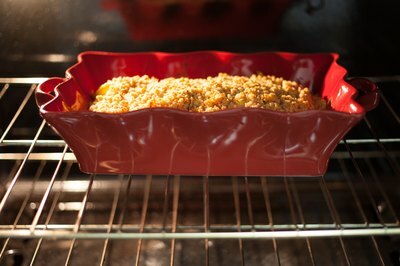 Bring this squash casserole to your next potluck dinner for a satisfying addition to the buffet line. This vegetarian casserole can be the centerpiece for your next meatless meal. 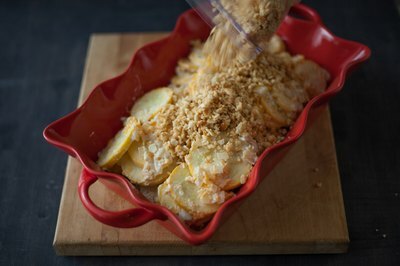 You can also bake the casserole and freeze it in individual portions that can be reheated for an quick lunch or dinner. Place one sleeve of Ritz crackers in a gallon-sized plastic bag. Remove as much air from the bag as possible and zip it closed. 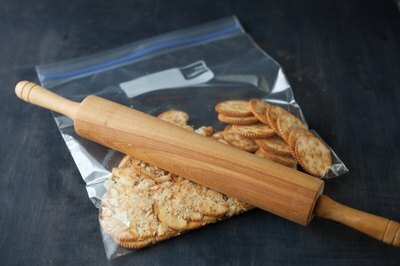 Beat the bag with the side of your fist to crush the crackers, or you can roll over it with a rolling pin, if desired. Crush the crackers until they are in the form of course crumbs and set aside. Dice 1 medium Vidalia onion. Peel 3 cloves of garlic and finely dice them. Heat 1 tbsp. of canola or olive oil in a large sauté pan over medium-high heat. Add the diced onion and garlic to the hot oil. Stir occasionally and cook until the onion pieces turn translucent. Remove the pan from the heat. Wash 2 lbs. of yellow summer squash. Cut the thin neck off of the squash, if you are using crooked neck squash, along with the stem end. 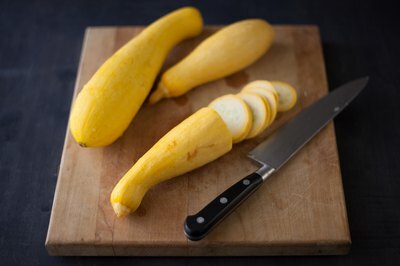 Slice the remaining squash into 1/4-inch thick slices. 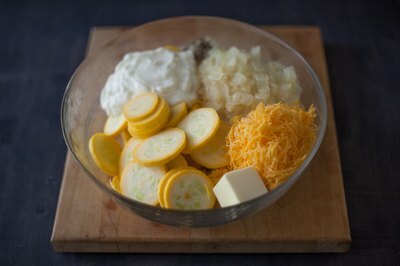 Add the sliced squash to a large bowl. 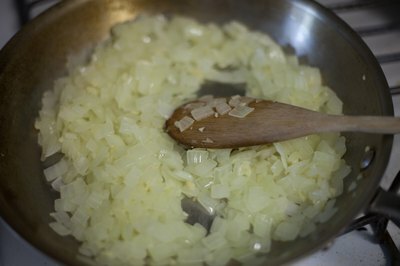 Toss the onions and garlic into the bowl. Add 2 tbsp. of unsalted room temperature butter, 1 cup of sour cream, 1 cup of shredded cheddar cheese, 1 tsp. of salt and 1 tsp. of ground black pepper. Stir the ingredients until well combined. Pour the squash mixture into a 2-quart casserole dish. Add 1/2 stick of unsalted butter brought to room temperature to the bag of Ritz crumbs. Squeeze and shake the bag to distribute the butter throughout the crumbs. Pour the buttered Ritz crumbs over the top of the squash mixture. Bake the casserole at 350 degrees Fahrenheit for 30 minutes or until it is bubbling. Let the casserole cool slightly before serving so the ingredients thicken and set. You can use any sweet onion in place of the Vidalia onion. If you are looking to reduce your fat intake, top the casserole with Reduced Fat Ritz crackers and use low-fat sour cream and cheese. You can also use Whole Grain Ritz as another healthy alternative to the regular Ritz crackers.